Texas has nearly 53,000 bridges, more than any other state. Over ten thousand (19%) are now structurally deficient and increasingly unsafe for the thousands of people who cross them daily. 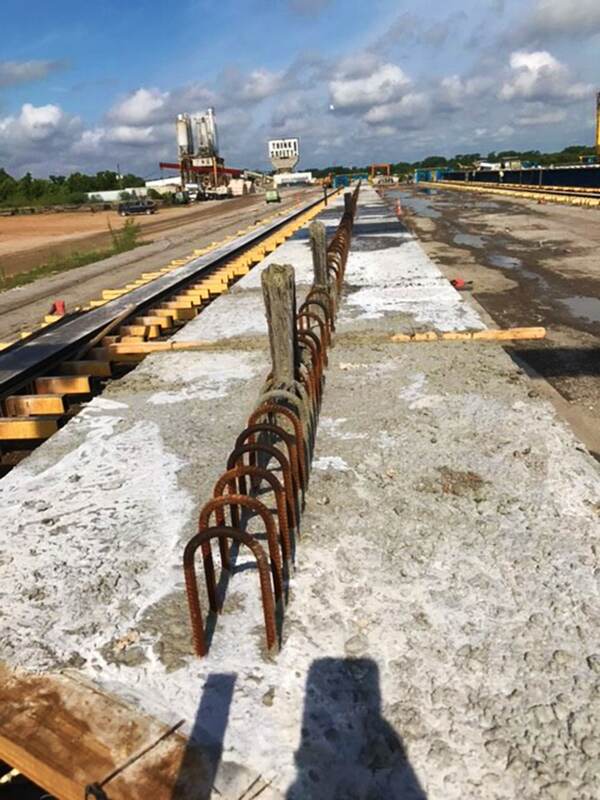 Fortunately, one of the largest manufacturers of prestressed concrete beams in Texas is now using EdenCrete®, the carbon nanotube infused liquid admixture for concrete. Approved for use in bridge beams by the Texas Department of Transportation, EdenCrete’s proprietary formula is beginning to transform the precast concrete industry through shortened production schedules, lower costs and more durable construction. The prestressing process involves carefully timing the interaction of different materials and forces. First, steel tendons are tensioned, then the concrete is poured. When the mix reaches a specified strength– an exact release point – the steel is cut, thus transferring the tension into the concrete. This reinforces the material, enabling it to counteract external stresses when later in service in a bridge beam. 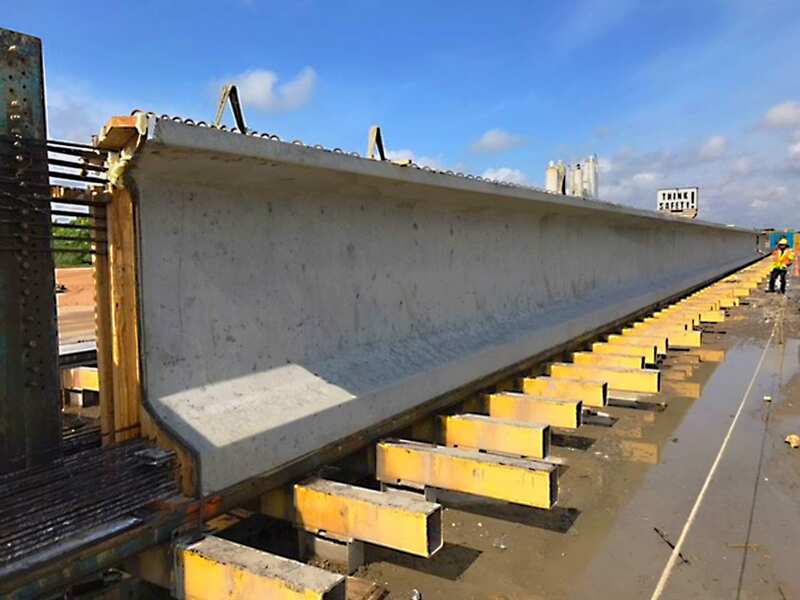 Typically, a manufacturer hopes to achieve the specified release strength in approximately 16 to 24 hours, allowing for the removal of formwork and inducing stress in the concrete members. Adding EdenCrete enables the concrete to harden more quickly and achieve the specified release strength sooner, so a factory can turn their forms over in as little as 12 to 14 hours. Traditionally, adding large amounts of cement and other chemical admixtures during prestressing is done to accelerate early-strength development and reach release strengths sooner, but compromises the long-term durability of the concrete. Using EdenCrete® enables a manufacturer to lower the cement content and reduce costs without sacrificing strength and performance. The concrete will achieve stripping and design strengths more quickly, with a smoother, more attractive finish that is highly resistant to abrasion, cracking, stains and water permeability. This multi-faceted durability has been tested through extensive research and development, laboratory experiments and field trials in various environments. Using less cement also means a greener footprint – by indirectly causing the release of less carbon dioxide into the environment. Recently, several departments of transportation have followed the Texas DOT lead in approving EdenCrete® for specific type construction projects, including Virginia, Georgia, Arkansas, Mississippi, and Tennessee, with other states under consideration. As the enriched concrete additive of the 21st century, EdenCrete® is a transformative material to the concrete industry and will have an enduring impact on a multitude of concrete applications. With each bridge built using EdenCrete®, the industry is literally building a new bridge between the past and the future of precast concrete manufacturing processes – one durable beam at a time.